I have tried calling the preset: Minecraft.ini, Java.ini, Javaw.ini, no help. I have tried with and without OptiFine, thus modded AND vanilla Minecraft, still ReShade does not load. While I am indeed using a non-Mojang launcher (MagicLauncher) to start Minecraft, using their own still doesn't work. I have tried the 32bit and 64bit ReShade DLLs, but no change. Set the Java.exe and Javaw.exe to "Run as Administrator", nothin again. Took ownership of the Java folder and sub-folders, still nope! I have tried putting the opengl32/ogl32 files inside the specific Minecraft version folder next to the jar file, no help. right now, but... You guessed it... still didn't load! I have used it successfully with Mass Effect 1 and 2 on this computer. performance, so it'd be nice to see what a person could achieve using ReShade. As you can see, it's indeed calling opengl32.dll. just from the SysWOW64 folder instead. Last Edit: 1 year 6 months ago by Formula350. Minecraft doesn't use your Java installation anymore, but rather downloads its own Java environment. Check the path that "java.exe" process was launched from. Also make sure you install the 32-bit ReShade DLL, since the game seems to run off a 32-bit Java environment (or else it wouldn't load DLLs from SysWOW64). Guess I should've mentioned that as well... I do NOT use the Stand-alone Minecraft (I understand the reason for it, but prefer not to use it). Mine's all old-school, and does indeed run off the Java in Program Files. Though I did mention that I have indeed tried both ReShade32.dll and ReShade64.dll renamed to opengl32.dll. I tried both inside the Java 64bit BIN folder, and the 32bit inside the Java 32bit BIN folder. No luck any of the times. Not much of a 64bit Java install if it's still calling 32bit versions of code :\ Minecraft's LWJGL is 64bit. Actually, the only time I ever managed to get SOME kind of life from ReShade was when I renamed the 32 and 64bit LWJGL files and replaced them with the 32 and 64 ReShade files. It just crashed Minecraft before loading, but... it at least produced a log file More than I can say for any other attempt! Strange. 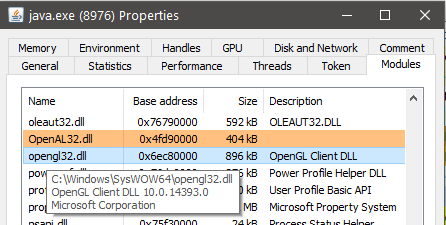 Looks like the DLL search is circumvented and instead they load opengl32.dll straight from the system folder. What you can do instead is inject ReShade with something like ENBInjector (or an equivalent injector tool for 64-bit, see Google): set the target process to java.exe and have it inject ReShade's DLL at startup. As I mentioned I don't use the vanilla Minecraft launcher, I use a 3RD party one (MagicLauncher) that's a little more user friendly with mods, allowing you to run them without having to actually install them. Nevertheless, it would see that the problem lies there. When I used the default launcher, ReShade worked and loaded! So I'll have to take it up with the MagicLauncher dev.